Provide USB interface to standard solenoid drawers! Nexa’s DT-100U Cash Drawer Trigger is designed to provide USB interfacing to standard solenoid based cash drawers. This allows cash drawers, previously attached to POS printers and cash registers, to be directly connected to be USB port. This gives you the option to use a cash drawer without a POS printer being needed. 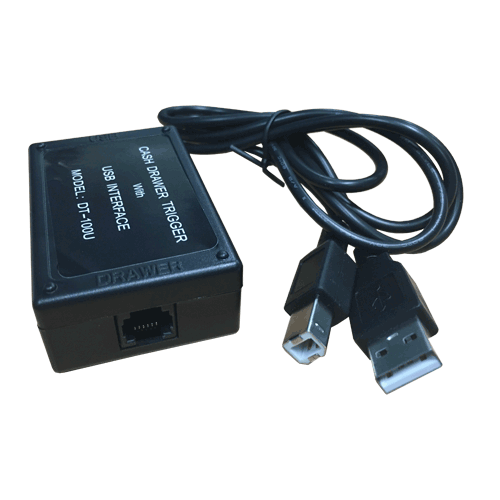 The Nexa DT-100U USB Trigger Module uses a Virtual Serial Port Driver, making it appear to software like a standard RS232 Serial Port. This way existing POS Software can communicate with the USB Cash Drawer Trigger as though connected to a Serial Port. A unique serial number is assigned to each USB Trigger Module and the Driver Software will assign the next available Serial Port to each device it recognises (multiple Triggers can be used on one PC).